all at a throw-away price! The Patient Guard® System is designed to isolate patient rooms - but also announce outbreaks, instruct visitors to wear precautions and reinforce hand hygiene. It does this through display rails that get mounted on every door frame, entranceway and passageway. Then when needed, an insert from our selection of messaging is hung from the display rail, in the path of those entering to effectively transform it into a clearly-defined isolation area. That’s all there is to it! To give one example, we made the inserts out of card stock. Why? For many reasons. Firstly, when a new insert is hung up, it’s fresh, colourful and new out of the box, ensuring it won’t be missed. After all, nothing says “ignore me” like old, dirty and faded messages. Secondly, they can be disposed of after use, reducing cross-contamination. Thirdly, they are lightweight and easily managable to store, carry and install. And lastly, they let us use a sleek and unobtrusive display rail for mounting. Its design allows for straightforward one-handed operation when placing or removing the inserts. Everything about the Patient Guard® System is designed to be elegant and impactful while using simple, easy-to-use and inexpensive parts. This system is made to be installed on every doorframe in a hospital - and does nobody any good if hospitals can’t afford to do so! Installation is easy enough a child could do it (with a ladder and adult supervision, of course), and the inserts themselves require next-to-no staff training to deploy. It is affordable to buy, affordable to install and affordable to use every day of the year. A visitor doesn’t even have to understand what “ISOLATION” means - if there’s one of our inserts hanging in the doorway, they know that something is up and that they need to take care. With messages all around you in a hospital setting, the Patient Guard® System is large, bright and easily the most noticeable of them. 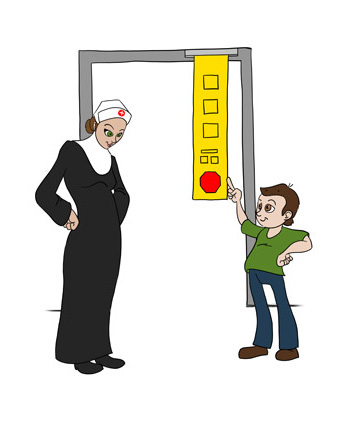 If people only read one sign during their hospital visit, have it be the one that can potentially save some lives. What about the majority of time when there’s no insert in the display rails? Remember the boy who cried wolf? Receiving the same message every day in the same place leads to it being ignored by staff; by only displaying the message during times of isolation (for example) you keep it fresh, ensuring that the messages receive the attention they need. As well, the display rails are carefully chosen to fit in with any decor and remain unobtrusive until needed. The Patient Guard® System is not alone. The icons we at Tagg Design Inc. created to communicate infection control messages are the product of years of development. Our Tagg Clean-Hands Sanitizing Stations and its corresponding line of signage, templates and other visual communication products have been helping hospitals ensure hand hygiene compliance in entrances, lobbies and clinics since 2005, and since they use the same icons as the Patient Guard® inserts they work together flawlessly. Such a consistency of messaging leads to quick recognition, which leads to better compliance, which leads to lowered spread of infection. Protect your patients, healthcare staff, long-term-care residents and visitors with the Patient Guard® System.